The East Galway Family History Society CLG is based in the village of Woodford in southeast County Galway. It is situated at the Woodford Heritage Centre, a parish-owned former school building dating back to 1834 located on Barkhill, at the southern end of the village. Established in 1991, the Society was established to provide a genealogical research service for national and international clients through the collection, transcription and computerisation of historical records for the East Galway area. It is a designated centre of the Irish Family History Foundation which is a countrywide network of centres that transcribes and computerises genealogical records along with providing an ancestry tracing service for the public. The East Galway Family History Society is a not-for-profit organisation and all the income generated is used to enhance and improve the services provided by the Society for the local community and visitors alike. ‘Dear Julie, It is just so wonderful to finally see church baptismal records, I have nothing but thanks and admiration for you and your efforts. It’s quite emotional for me really. My grandfather was quite young when his grandparents died, but he did remember Lawrie and Celia, as they were known locally. He told me of a short statured, white-bearded Irishman smoking a pipe seated in front of the fire with a large blanket wrapped around him. Ironically, for most of my childhood at least, and minus the pipe, that’s the way I remember my own grandfather, who was also Laurence (Larry, or ‘Pa’ to me), like his own father too. Having this information just ties my own sense of identity to Ireland that much more and I dearly look forward to the day I can visit Galway and tread in some of the footsteps of my ancestors – a journey now made that much more significant and easier, by you. 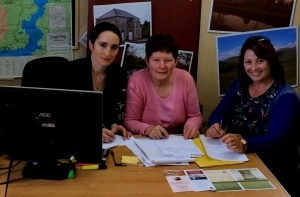 Additionally, the Society promotes tourism, business and heritage awareness in the east Galway area and also participates in local and national events in heritage related activities. At our centre in Woodford we have the most extensive range of source material available for East Galway. Please note that Church records of baptisms, marriages and deaths/burials vary from parish to parish. Roman Catholic Church records – baptisms, marriages and deaths, commencing 1766 to 1917 approximately. Church of Ireland records – baptisms, marriages and burials, commencing 1747 to circa 1900. Civil records – births, marriages and deaths, commencing 1864 to 1911 approximately. Griffith’s Valuation – property valuation dating from the mid 19th century of the land and householders in the country giving townland, details of holding and name of immediate lessor. Tithe Applotment Books – a similar list, although not as comprehensive, compiled in the 1820s and 1830s to determine the amount of tax payable for the upkeep of the Established Church (Church of Ireland). Trade Directories – Pigot’s and Slater’s commencing 1824 to 1896. Lewis Topographical Dictionary – published in 1837. Burke’s Peerage and Baronetage – published in 1850. School Roll Books – available for a small number of South East Galway parishes only. Ordnance Survey Maps, historical maps and many other sources pertaining to individual parishes. Please note this list is not exhaustive; details of other sources which are not given can be obtained by contacting the Society.